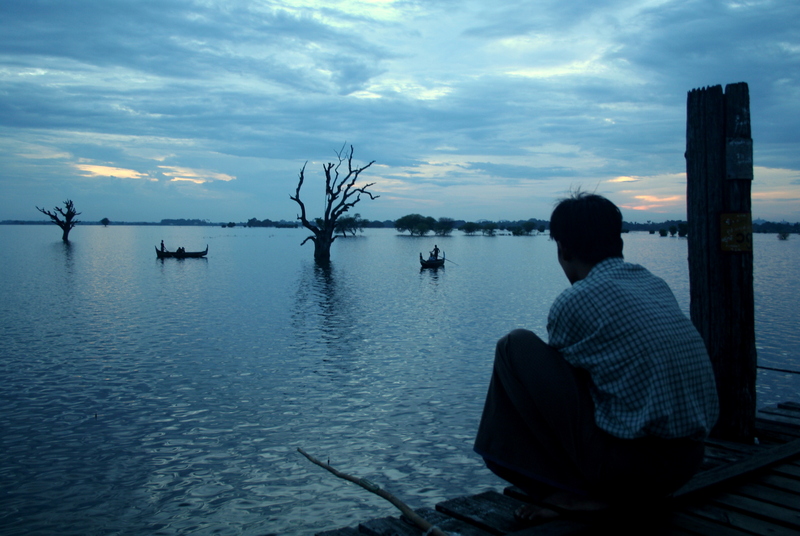 Sitting up on a plateau in the foothills of the Shan mountains, Inle Lake is one of the most popular tourist spots in Myanmar. But it’s still incredibly low key, with most villagers focused on their day to day business rather than trying to make a quick buck from tourists. Everything about the place seems to relax you. The main draw here is the stilted villages of the Intha. 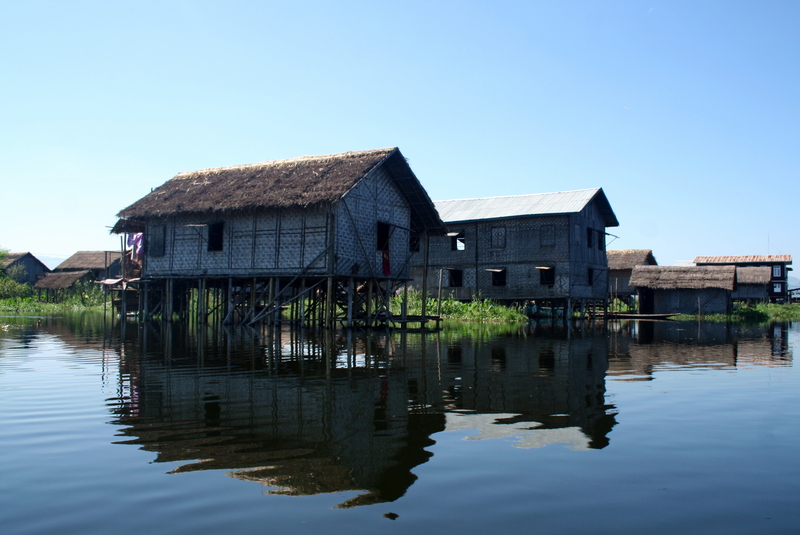 Whole communities are built out on the lake and getting around means going by boat – even to your immediate neighbour. The famous Intha Leg Rowing is always on show when a tourist appears, though I’m sure It’s not as popular as it once was. As with nearly all of the people in Myanmar they are some of the nicest in the world, with not even a hint of danger anywhere. This could be the friendliest place in the world. Most countries are happy with two or three, in fact many have only had one, ever . In Burma they like to do things diferently, changing the capital like everybody else changes their clothes. 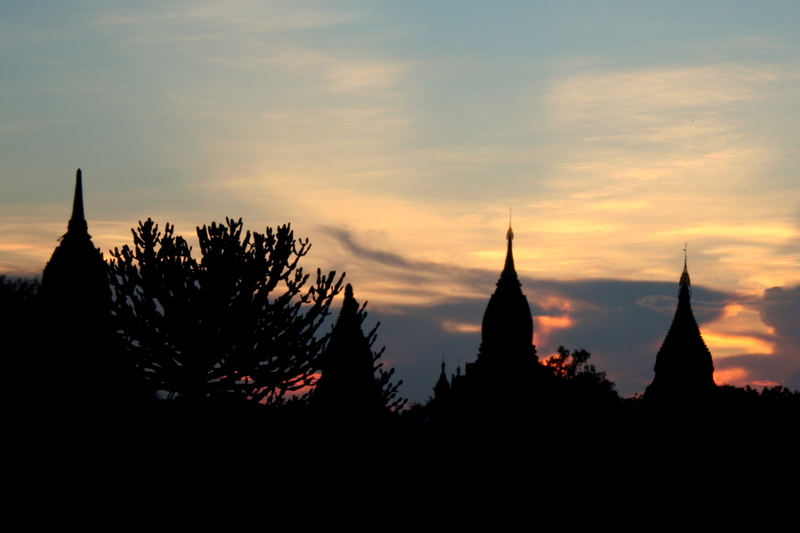 Well maybe not quite, but they even changed the capital from Yangon only a couple of years ago – apparently because a fortune teller told the Generals to! Anyway Here’s a couple of photos of Inwa, Sagaing, Amarapura and the snake temple at Paleik – where three snakes turned up one day in the 1970’s wrapped around a Buddha Image and decided to stay. 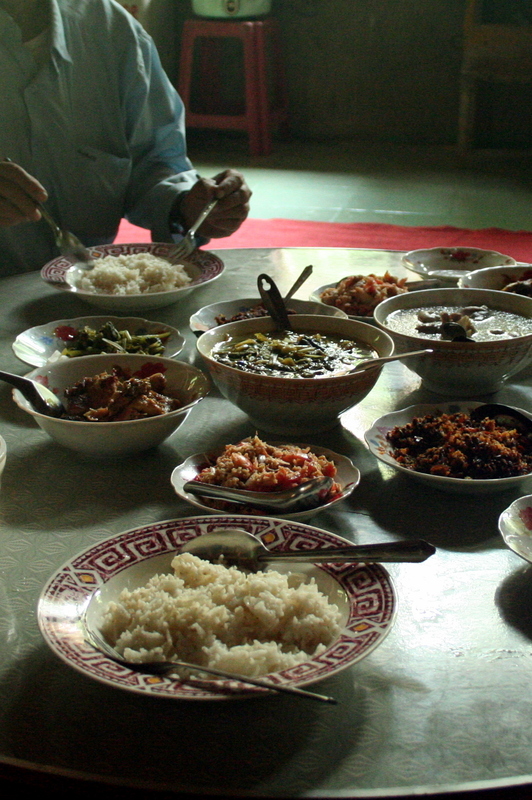 This is pretty much the national meal in Myanmar. A small portion of meat or fish slowly stewed with mild spices till its almost falling off the bone and the oil and solids have separated. Then it’s served with lots of different vegetables and condiments such as fried aubergine with fermented fish paste, green vegetables and garli isc, a really thick yellow lentil dhal and a thin broth made of watercress and tamarind. Finally some fresh wingbeans, crisp cabbage and cucumber are common – nice to dip into the ubiquitous spicy dried fish condiments that also come with the meal. The curry it’s self isn’t so much an indian style curry, its more South East Asian in flavour, but the whole meal similar to an Indian thali. And like other SE Asian Food the vegetables are served crisp and green. Its a pretty well balanced and satisfying meal. Loads of fresh green vegetables, pulses, some rice and a little bit of meat – or fish. It’s especially good washed down with one of the local Myanmar beers. I could eat this every day. Built from the 9th to the 13th century as the capital of the First Bamar Kingdom, Bagan is one of the most epic ancient landscapes ever created by man. Over the years various Kings tried to put their stamp on the area by sponsoring projects to build massive monuments to their Therevada Buddhist Faith. The first of the great kings Anawrahta conquered the Mon kingdom in the south and brought back their Tripitaka scriptures and adopted their new form of Therevada Buddhism. It finally ended in 1287 when the Burmese army was defeated by Kublai Khan after refusing to pay tribute. In those couple of hundred years they managed to do quite a bit of work. Its literally temple after temple all the way into the distance and barely another tourist in sight. 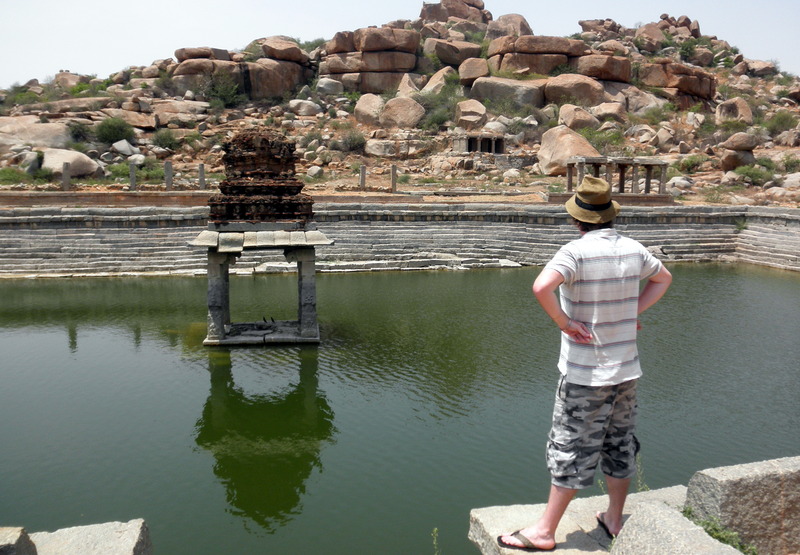 Three to four thousand temples and monuments altogether- depending on who counts. Small and large they dot a plain next to the mighty Irrawaddy river. It’s an atmospheric place to be, especially as the sun is setting and you can see from one of the higher spots all out over the plain. Anyway words – and photos – can’t do justice to this wonderous place. Everybody should make this top of their to go list. For the people that cant go I’ve got a few photos. The first thing I’ve eaten in Burma thats really stood out. 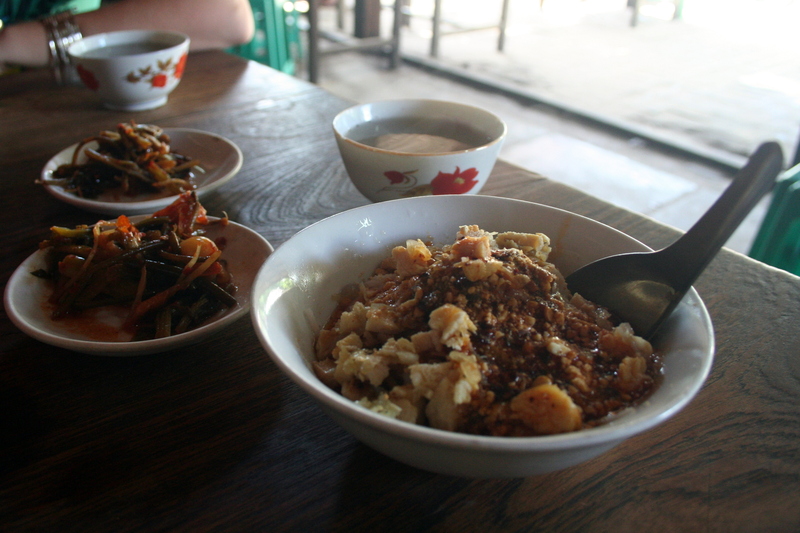 The locals eat it at tea shops for their Brekkie or just as a snack. They warm a bowl of fresh Rice noodles then throw on a spoon full of spicy peanut sauce, some chopped coriander and chinese chives, and a little diced roast chicken – then add so many condiments it would take all day to list them. This is all served with some pickled greens and a bowl of chicken broth, which you can use to make a soup if you want to eat it that way. Can’t begin to tell you how tasty a combo it is – crunchy nuts, spicy chicken and that great broth to moisten it all up. Perfect to set you up for a day of temple hopping. 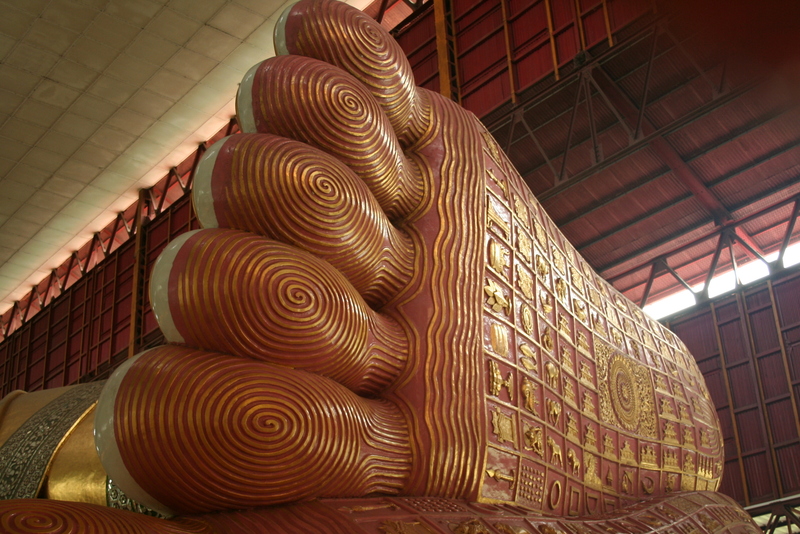 Wanting to visit some of the more peaceful temples we ventured to the north on Yangon where we visited two amazing buddha statues. One a huge reclining Buddha at chaukhtatgyi and another over the other side of the road surrounded in small monasteries, an equally massive seated buddha covered in precious stones. An older man who showed us around the area and took us around a couple of the monasteries – some of which are housed in old collonial buildings. We met the Abbot of one of the bigger monasteries, Surya, and he insisted we come to visit. He force fed us fruit, cakes, dry fish and wouldn’t take no for an answer. 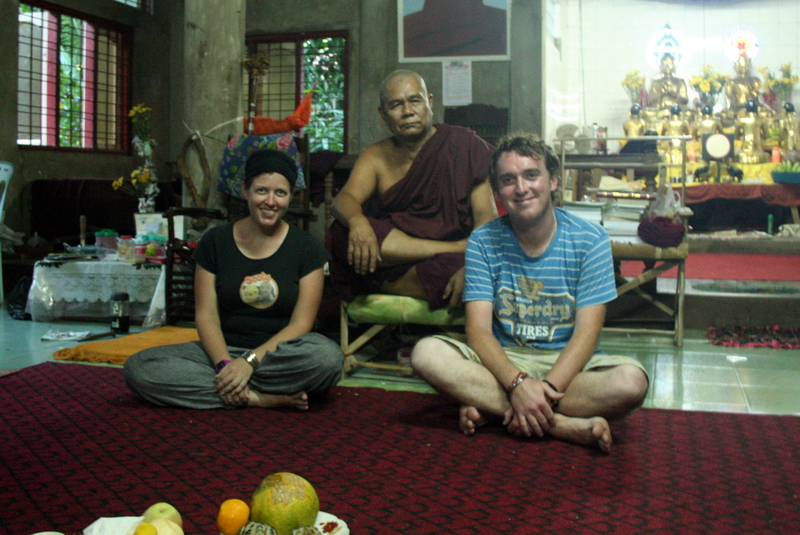 He was very happy I had a little undertanding of Buddhism and insisted we return there the next day to have breakfast. We took a gift of new robes and had a little giving ceremony. Then afterwards he declared that we are both Buddhists now . He told us he had special powers and as long as we think of him we wont come to any harm – Thats pretty handy I thought. Also he gave me my own Buddha relic in the form of a carved Buddha in a small tube. After this the monks had breakfast and we lay people waited till they had finished and then got stuck into the feast. 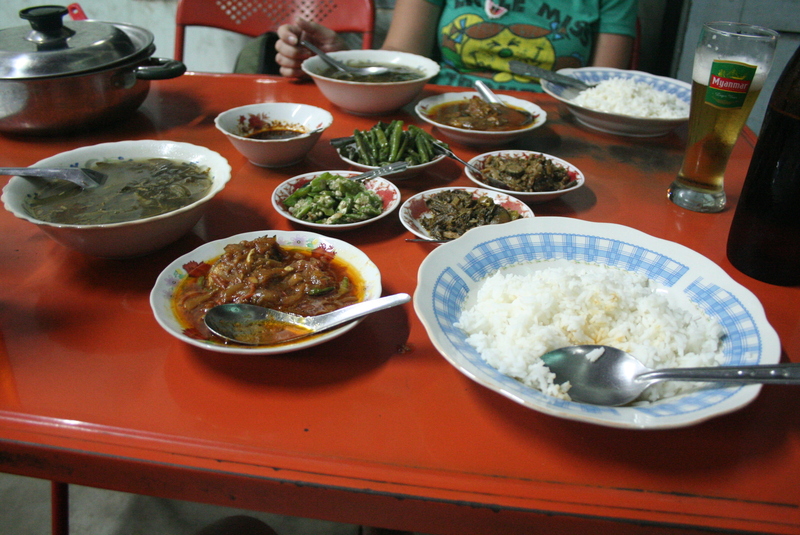 And what a feast it was – Fish, Pork, Fried greens, Rice, Soup and enough dried fish to feed the 4000. It was great. The monks and their friends really looked after us. We couldn’t have felt more at home. We were sad to leave. Definately one of the best experiences of our trip.